Rosemary Essential Oil Boosts Memory Retention - Simply Snifff It! Rosemary has long been associated with good memory. Dr. Chris Van Tulleken says there are three types of memories: past, present, and future. Each plays a different role and each has its own difficulties. Past-memory is being able to remember your experiences; essentially its what you’ve learned at school. Present-memory is minute-to-minute memory; being able to remember what just happened shortly after it has happened. Future-memory, or “remembering to remember”. This is the one many of us have problems with. We forget our spouse’s birthday. We forget to pick up grocery on the way home. We forget what we just did, or what we went into the kitchen for. We forget, we forget. How do you naturally and easily improve and retain your memory? Professor Mark Moss at Northumbria University in Newcastle, England, had a team running an experiment to test whether rosemary essential oil could benefit future-memory. The team recruited 60 older volunteers to test rosemary oil’s effects on memory. The subjects in one room did surprisingly better than those others at remembering these seemingly menial tasks and questions. The team who fared better was set up in the rosemary-infused room. Those in the lavender-infused room had a significant decrease in performance (because lavender is a natural sedative). There are compounds in rosemary oil that help with memory. One, 1,8-cineole smells very nice, causes an increase in activity of a neurotransmitter called acetylcholine. Inhalation is one of the best ways to get rosemary’s effects straight to your brain. Mark and his team were able to analyze blood samples from the subjects, and found traces of the memory-boosting chemicals from rosemary oil in the blood of those who sat in the rosemary-infused room. There are troubles associated with implementing your own brain-boosting medicines, even if it is just the idea of inhaling natural essential oils. This study was performed to better understand rosemary’s potential use in fighting mental disorders like dementia, but you can also bring some of this knowledge home. Indigestion: Rosemary oil is often used for this relieving flatulence, stomach cramps, constipation, and bloating. The essential oil is also deemed helpful in stimulating appetite. Research shows that rosemary essential oil can help detoxify the liver and help regulate the creation and release of bile, a key part of the digestive process. Stress relief: Aside from its aromatherapeutic benefits, rosemary oil is seen to decrease the level of cortisol, one of the hormones released during the body’s flight-or-flight response to stress, in the saliva. According to the 2007 study, inhaling rosemary and lavender oils for five minutes significantly reduced cortisol levels in the subjects’ saliva, potentially decreasing the dangers of chronic stress. Pain relief: Rosemary essential oil is promoted for its ability to relieve pain, which is why it’s widely used in treating headaches, muscle pains, and even arthritis. Massage the affected area with the essential oil, which you can also add to vapor baths for the treatment of rheumatism. Its anti-inflammatory qualities make it a good way to address pain from sprains and joint aches. Immune system boost: The same 2007 study that found reduced cortisol levels after simultaneous massage and inhalation of rosemary essential oil found that the free radical-scavenging activity in the subjects’ bodies also significantly increased. 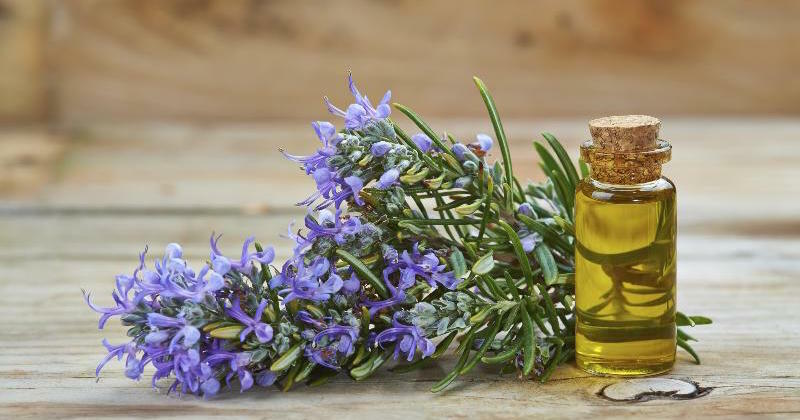 Antioxidants are a valuable weapon to fight off infection and disease, so this benefit of rosemary oil is welcome news—regularly using or inhaling it can support your immunity and help you fight off diseases linked to free radicals. Respiratory problems: The scent of the oil has been shown to provide relief from throat congestion, and in treating respiratory allergies, colds, sore throat, and the flu. Its antiseptic action also makes rosemary oil useful for respiratory infections. Because of its antispasmodic effect, it is also used in certain treatment programs for bronchial asthma. To use rosemary oil to improve your future memory, mix 3 drops of rosemary oil with ½ teaspoon of coconut oil and rub on upper neck or diffuse for one hour a day.